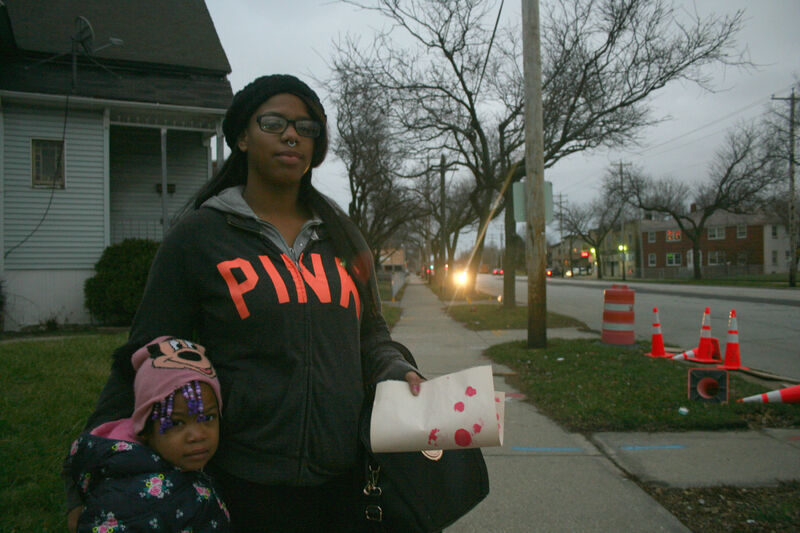 Shauratina Velez waits at the corner of 12th and Atkinson with her four-year-old daughter for the Route 19 bus. Velez, 22, was 17 and a junior at North Division High School when her daughter was born, and it’s been a tough road ever since. “The first time he ever seen her is when I had her — he came the next day. And, after that, I never seent him again,” says Velez, adding that she found out he was in prison through his parents. Shauratina, who is in the process of getting her GED, says W-2 agencies have been helpful with learning how to communicate and guiding her through the GED process, at no cost. It’s also been necessary; she didn’t get much help from anywhere else. Shauratina, who takes her daughter to school every day on the bus because the school hasn’t arranged transportation, says it’s been more than difficult the last few years. But it’s also her daughter that keeps her going. Once she gets another job, Velez plans to move to the South Side where there’s “not so much commotion.” But that isn’t where her aspirations stop. Did you find value in Shauratina’s story? If so, please subscribe to our newsletter; we publish a story of a different Milwaukeean every week.